The number one reason for hiring a planner for the wedding day is to allow you and your family to enjoy the wedding day instead of “work” it. After helping many, many couples through their wedding day over the years, we've designed a package that truly makes this happen. Our Wedding Day Management package allows our couples to relax, not only on the wedding day, but during the planning process because we're there early enough to make sure no detail is missed. We start at the beginning, setting you up for success with advice and education, along with custom vendor recommendations to fit your needs and budget. You take it from there to plan the wedding of your dreams, with us in the background, available for advice and questions as you need us. You are in charge of your own design, budget, negotiations and planning, but before your big day, we’ll jump back in to finalize all the details and make sure your rehearsal and wedding run smoothly. With this package, while you handle the planning, we give you the tools so you have the confidence to make good decisions, the reassurance that you have everything covered and the peace of mind that it will all come together just like you planned. You made me feel like a guest, along with 120 others, and you did it seamlessly. Without you, it would have been chaos. The day of our wedding was an absolute dream. If something went wrong, we didn’t know – everything was absolutely perfect! I have gotten so many compliments from friends, family, and vendors about how well organized everything was and how much fun they had at our wedding. 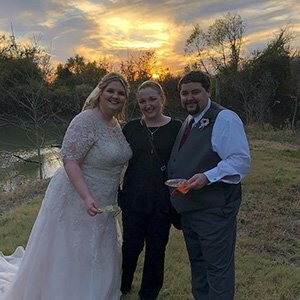 She gave us many valuable suggestions, and answered all of our questions while respecting our choices and facilitating our wedding as we envisioned it! Her organization was a lifesaver as the wedding approached. The whole process was so much easier and stress-free because of her!